Start building your paradise with pool construction from Paradise Pools! Now that introductions are out of the way, we can get on with bringing you interesting, helpful, and maybe even fun weekly blog content! This week we’re diving head first into pool construction, everything that Paradise Pools offers, and the awesome benefits held within. Let’s get started! If you read last week’s flagship post, you already know that Paradise Pools brings you only the best in pool construction. What exactly goes into that work though? We’re glad you asked. First of all, all of our pools are built with gunite rather than fiberglass. As a Maryland pool company, we wanted to make sure we were using a material perfect for our customers and the region we work in. 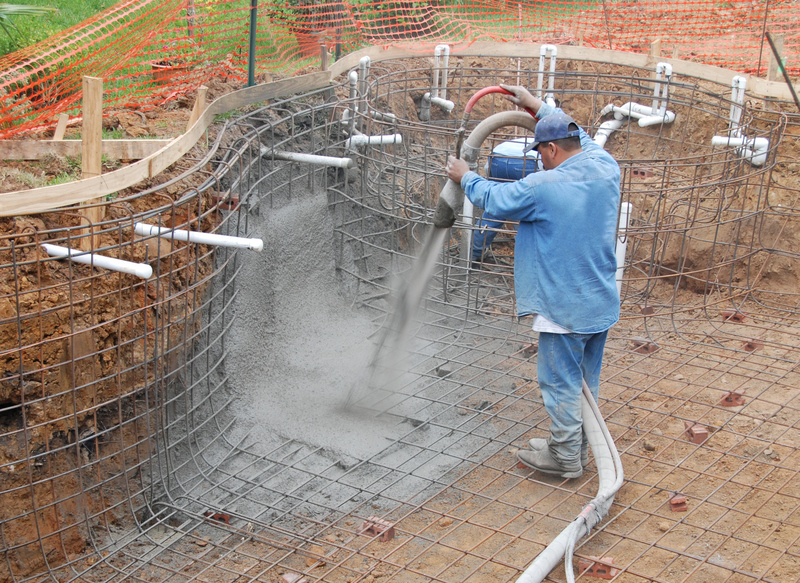 That’s why we chose gunite — because it can handle the deep freeze of winter without cracking or shifting in the ground, and it’ll be in just as good shape as you left it when winter thaws, so you won’t have any problems before opening your pool to take a dip during the Mid-Atlantic’s blistering, humid summers. In addition to thinking ahead with gunite, we also install a 14” structural beam to reinforce freeze protection. Long story short: you’ll have one tough pool in the middle of your paradise when you work with us. A pool is one thing — building around it is a whole new story. Similar to pools, spas can take the enjoyment of your pool to the next level. We’re also an experienced spa contractor, with plenty of experience in design and installation. There’s no better way to unwind after a long day, or warm up on a chilly summer night after an evening swim, than relaxing in your personal spa. We’ll help you design a custom spa to fit your needs and your budget, and do so that it’s a perfect complement to your pool and entire backyard design. As a full-service backyard design contractor, we can ensure that your design is cohesive and functional to create a truly unique outdoor living space. If you’re looking to install a new pool in Maryland before summer, Paradise Pools will be more than happy to help with pool construction and everything else that goes into building a backyard paradise. Just give us a call! This entry was posted on Wednesday, April 6th, 2016 at 2:57 pm. Both comments and pings are currently closed.